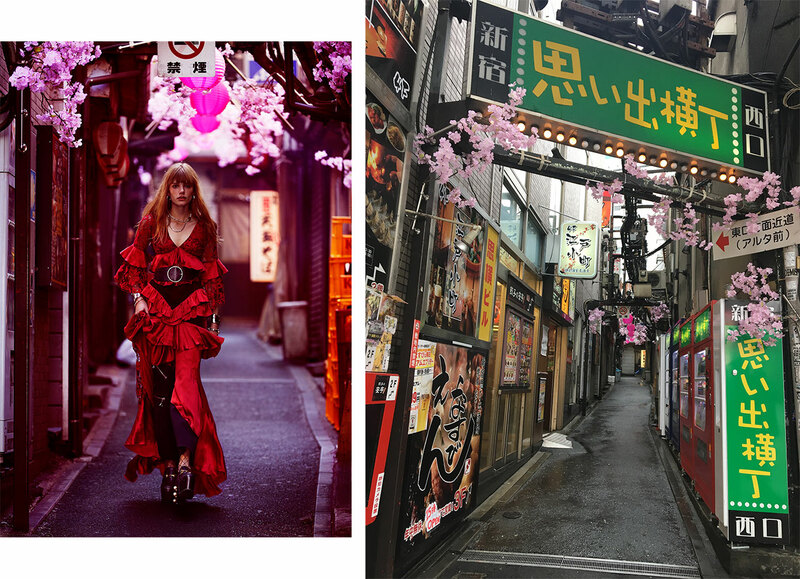 After a recent visit to Japan to shoot a Fast and Luxurious fashion story during Sakura – or cherry blossom – season alongside photographer Steven Chee and GRAZIA Fashion Director Charlotte Stokes, hair stylist Richard Kavanagh takes you behind-the-scenes on a whirlwind drift through Tokyo. What strikes you most about Tokyo beyond the bright neon, giant anime cartoons advertising luxury fashion, and uber cool street style of the locals on the street, is how clean the place is. 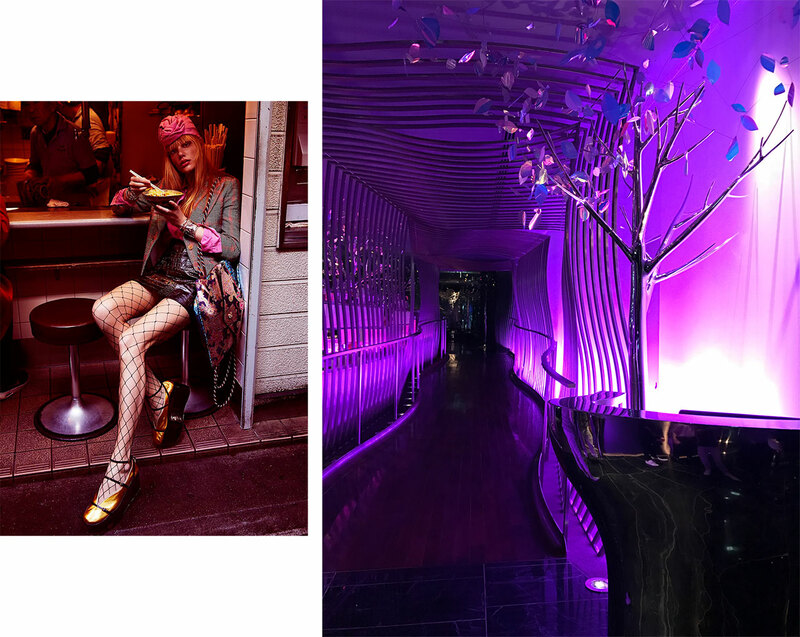 Shooting in the deepest part of Shinjuku, Tokyo’s red light district, there’s no litter, no dust or dirt on the streets or buildings, and even the rundown strip joints and hostess bars are carefully and lovingly kept spotless. However, as we discovered, it’s still important to be careful where you set up your crew and start shooting. The local mafia, the yakuza, run a tight ship, and if you encroach on their turf in the wrong way you’ll get moved on quick smart. Negotiating the language barrier is hilarious, and many ‘lost in translation’ moments are ripe for the picking. A few words of Japanese like ‘please’ and ‘thank you’ go along way; most places have signs with English characters so it’s much easier to travel than it once was. Arriving late at night, we discover our accommodation in in the heart of the gay club area. There are overt signs advertising the, ahem, opportunities, within the clubs and video stores; eateries and bars overflowing with people; and lots of party (read: drunken) antics from blokes in the streets. As we were very hungry after a 70km drive from the airport, we decide some Robata grilled meat was in order washed down with a pint of icy, frothy, local beer. Our good looking male photographic crew were flirted with very politely as we ate, and the chef explained in broken English that the white, crescent shaped objects grilled on skewers that we were eating were the shoulder cartilages of chicken. Well, at least the shiitake mushrooms were great, as were the gyoza and beer. Vending machines are on every street corner, so sweet, hot coffee in a can for a dollar gets us going before a delicious local breakfast of noodles and soup with pickles and salmon ordered from a restaurant screen early on our second day. We visited Ueno Park near Tokyo central in the hope of shooting there, but the blossoms weren’t quite out yet, and it was a little cold and clinical for our liking. So, after purchasing a Suiko card for the very efficient trains, we could tap and go our way around the city in search of more blossoms and beauty. 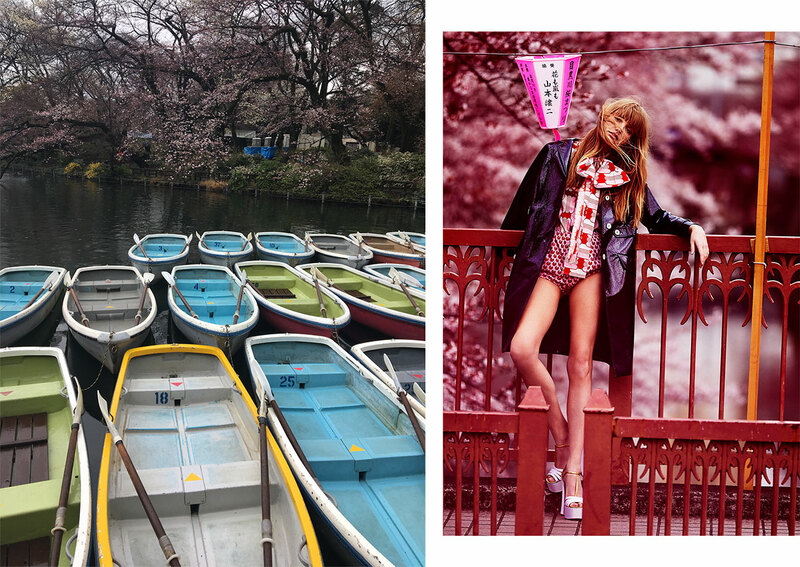 Inokashira Park in the Musashino district was next on our list. A gorgeous park with walkways all around a central pond and the most exciting feature, two person pedal boats in shape of giant swans! In Japan, the rules are the rules. And there’s no bending them. The trains run on time, people line up in orderly queues, and everything works like clockwork. So, unfortunately, even after lots of flirting and the offer of a very generous tip, our extremely diligent boat ride operators couldn’t let us on the swans before the official opening time, and we had other places to be. Back on the train after another hot coffee in a can from another vending machine (the novelty of which was starting to wear off; we really needed to find one of Tokyo’s many excellent coffee shops) and back to Shinjuku for the famous Shinjuku Gyoen Park, with its over 2500 cherry blossom trees and beautiful open lawns of pale, carpet like kikuya grass. Even though it was only five degrees and raining, the park was absolutely spectacular. At the height of the sakura, the queues to get in can be frightening and everybody’s bags are searched to make sure no one is bringing in any contraband. Despite the thousands of people, it only takes a few minutes and 200 yen to get through the gates. The taxis in Tokyo are so cute! They are mostly old Datsuns that have been kept in immaculate condition. All have doilies on the seats and in the back windows, and the white gloved, handsomely uniformed drivers open the passenger doors via a series of levers hidden discretely on their side of the car. Speaking slowly with clear annunciation of each consonant, some hand signal and the help of Google Maps, we arrived at Shibuya crossing. Fuelled for action we walked from Shibuya to Harajuku where, along the way we discovered a great coffee place called On The Corner. Finally! Decent coffee. And by decent, I mean quite possibly the best coffee piccolo latte in the northern hemisphere. Cat Street in Harajuku is lined with retail stores, one of the most exciting being the four-story second hand designer goods outlet Ragtag. We nearly loaded up on Gucci and Prada bags thinking they were reasonably priced, but a quick check on the currency converter app revealed that we put the decimal point in the wrong place and they were in fact several hundred dollars. A bargain, still, but not quite the bargain we thought. One of our crew was celebrating a birthday, and what better way to celebrate a birthday than pretending to be Scarlett Johansson and Bill Murray in Lost in Translation sitting in the bar on the 57th floor of the Park Hyatt in Shinjuku, overlooking Tokyo and drinking whiskey. At the perfect moment, one of the crew turned in his chair, looked intensely at the rest of the table and uttered, “For refreshing times, make it Suntory time.” Indie film moment had, it was time for dinner. Peter at The Peninsula, named after the global COO of the Peninsula Group of hotels, is perched on the 24th floor of the Peninsula Tokyo overlooking the Imperial Palace. It was dark, so the Palace wasn’t much of a drawcard, but the interior of the restaurant (pictured above) and their revolving light show was spectacular. Entering the restaurant we were greeted by Joseph, the Alabama native who is head of Food and Beverage, and shown to our table. First order of business, an aperitif to get the digestive process and conversation flowing. A mix of classic and signature cocktails were ordered and sampled by all at the table, including Peter’s signature dill and elderflower martini: a fragrant drink garnished with a sprig of dill. We all ordered the grilled four course dinner and our vegetarian mate substituted the steak for salad. An amuse bouche of Chutoro tuna tartare, salmon roe, celeriac mousseline and potato chips was served first by way of some palate cleansing deliciousness. Pan-roasted Hokkaido scallop seared to perfection with Canadian lobster, pancetta-shiso roll and pickled beets soon followed, before the chef came and served the main course personally: a Gifu prefecture A5 wagyu steak served with white and green asparagus, red wine sauce, steamed seasonal root vegetables with a light butter dressing. Tender and cooked to perfection, the steak rendered the party silent in quiet reverence for this perfect dish. Dessert was pineapple cake with coconut flakes and a selection of sorbets washed down with an 18 year old Yamazaki Japanese whiskey, followed by espresso. It seemed almost blasphemous to go back to work after such an incredible meal sparked with great conversation about life, career and gratitude. However, we had locations to explore and a city to uncover. So down to Shibuya, where the world’s busiest pedestrian crossing is to try and find the ideal spots to shoot. With sore feet, and full bellies and minds, we retired at late to the soothing sounds of revelling in the gay bars below. A quick check of our apple health app would reveal that we had walked over 30km in less than two days.